The tarot card contemplation symbolizes a profound phase of contemplation, tranquility, calmness and self-knowledge. 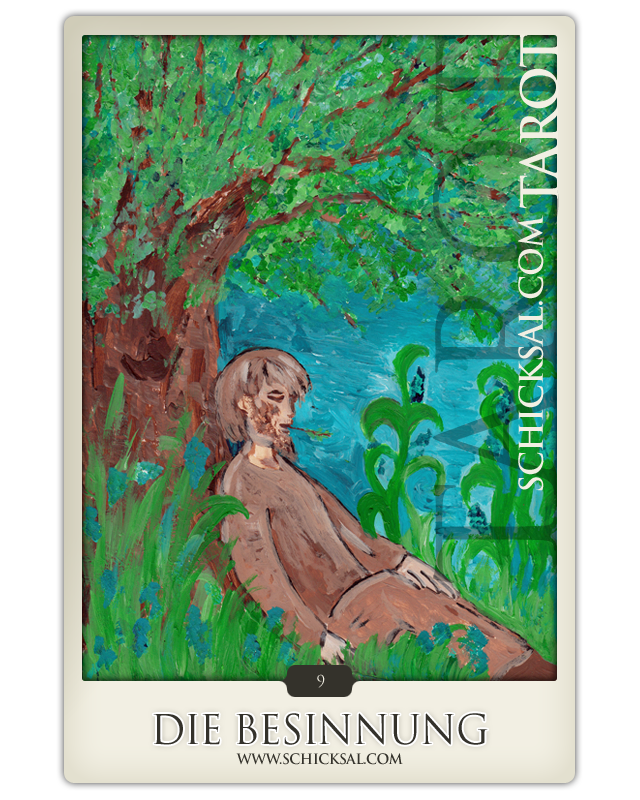 The tarot card contemplation shows a man that lies beneath a lush tree. All alone he sits beneath the tree with his eyes closed. It seems that he is sunken in deep relaxation and contemplation. The tarot card contemplation symbolizes a profound phase of contemplation, tranquility, calmness and self-knowledge. It asks for contemplation and shows to retire from business and other disturbing circumstances. You are found far away from daily life and its challenges by busy interruptions and frantic work. So by the way you are just able to come to know whatever your senses reveal and what experiences should come to know. This time of inner dialogue intend to clear your mind and gives various perspectives. Evolvement of new forms and new goals in your life appear. Individuality focused on your goals and plans in life. Passed time and experiences can be reflected meanwhile. The time is now a time of mediation and focused upon your personality and individuality. Such a phase is now and again absolutely recommendable in our frantic life. Dark or negative side of the tarot card contemplation reveals isolation the refusal to participate in daily life or just the opposite you refuse to have a break for a while – by the first occasion sway a loss of reality or realism in your life, the second occasion brings failure and the lack of initiation. Within that relationship you lead it is natural to take yourself a time out for a while when you feel that way. After that you might feel closer than before. For singles it is not the perfect time to meet someone new – the wish to be alone is predominant and contemplation is useful as well to start a journey of unique initiation. For professional life it would be useful and helpful to pause. Look backward and dare whatever you gained. These experiences could bring valuable knowledge. Stress should be avoided during this period because it would not be a support for your thoughts and contemplation. The search for a resort of calmness and isolation could support your time out and favoured your contemplation. By the way is given you the advice to keep some distance to daily life. The day is perfect to take some time out for yourself. Away from the office, school or any places that are busy. It is a time to think over and give you a rest. Look upon essential things and divert your mind.